Great Parker Scores for Pazo Barrantes! 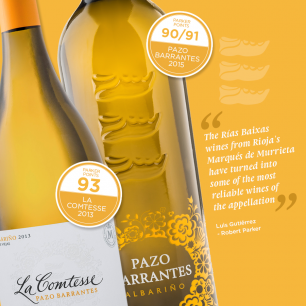 The latest vintages of Pazo de Barrantes’ two Albariños have received outstanding Parker scores. After tasting the wines, Luis Gutierrez said that ‘the wines of Pazo de Barrantes, in Rias Baixas, have become one of the best values of this Appellation of Origin’. Located in the Salnés valley, just a few kilometres from the Atlantic coast, Pazo de Barrantes boasts 12 hectares of Albariño vineyards surrounding their 16th century Galician Palace. All the vines are trained high on supporting wires in the “Parral” trellis system, as is the local tradition, to guard against mildew and rot, and also to assist ripening. The soil is sandy, acidic and shallow. The Pazo Barrantes style is rich and full, released last out of all the wineries in the region after a slow malolactic fermentation and is intended to develop well in bottle. Contact Christine to find out more about these high scoring wines.